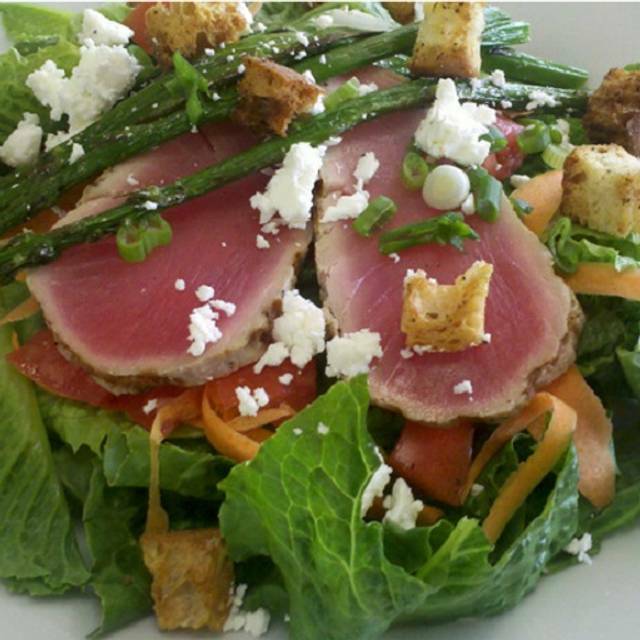 Located in Historic downtown Fredericksburg, Virginia, Cork & Table is a chef-owned and operated cafe serving lunch and dinner; we feature modern American cuisine with French influences. We also offer a full selection of retail wine and beer from here and abroad, as well as an array of gourmet cheeses, local and international, and prepared foods. In making selections for our menu and store, we strive to buy locally, respect the seasonal nature of food and wine, and support small businesses such as our own. My favorite restaurant in Fredericksburg. Food is delicious and thoughtful, wine selection is impressive, and service is always top-notched. My husband and I come here once or twice a year when we are in town and look forward to our meals each time. Always a great meal. Good service, great food. Ventilation needs improvement, looking forward to new location. Cork and Table has a small staff and the majority, if not all, of the food is made to order. Keep this in mind while waiting for service and your food. The wait is well worth it and you won’t be disappointed. You can tell the chefs take great care it their ingredient selection, preparation, and presentation. Everything we ate was beautifully prepared and amazingly delicious. It isn’t advertised that much and there isn’t always a paper menu available, but do yourself a favor and get the Chef’s Tasting Menu. The chef will be happy to come out and go over it with you. If you enjoy wine, then definitely go with the Chef’s Tasting Menu and wine pairings. Do yourself a favor and take a trip to Cork and Table. Food was amazing and it was a perfect atmosphere for date night! Wine pairings are fantastic! Don’t pass them up. Cork and Table should be your "Go To" place in Fredricksburg.. in fact even if not in Fredricksburg, go here! The food is delicious and fresh. Wine list is full of many varietals and all fairly priced. Owner Jim is friendly and took extra time to speak to us about the wine list and his favorites. Do not over look Cork and Table, it is absolutely worth the visit! We cannot wait to go back! Early Valentine’s Day dinner. Lovely place. Our first trip to Cork & Table was exceptional. The food was outstanding and the service was excellent. The only disappointment was the fact that they didn’t serve liquor. My husband is not a wine drinker and he would have enjoyed a drink. Excellent food. Deliciously prepared and all very tasty. Love the pairing with the wines. Recommend this fine establishment!! Great food, very good service and the suggested wines were very affordable and paired well with the food. My husband and I went during restaurant week, so it was a choice of 2 menus. The service was excellent, and the wine choices were very good. Unfortunately, our soup course was cold, which diminished the flavor, but we ate it. The beef entrée was outstanding, and the dessert was excellent. We were glad to hear that the restaurant is moving to a larger place. This will improve the ambience considerably. to return to his the Cork & Table again. We highly recommend Jim and his restaurant!! Very narrow dining area which creates a lot of noise. Smoke from kitchen was very uncomfortable and enough to irritate eyes. Gluten free options on menu were not available, a serious health issue if the diner did not ask specifically. Food was excellent. Service slow on a busy night. This was a European dining experience. Three Exceptionally well cooked, tasty and well presented courses with good wine pairings moderately priced. The staff friendly and personable. The only reason I didn’t give the dinner 5 stars was the vegs and potato were served just like warm. Cork and Table is a great place for a really nice meal. It is our goto place for special occasions ( birthdays, anniversaries, or just a special meal. Food, service and wine is consistently excellent. Food was great.had the tuna and it was done to perfection. My husband and I both loved everything about our dinner experience. Highly recommended! Wonderful, reasonably-priced prix fixe menus, plus plenty of a la carte, and an awesome wine list. Staff was lovely and accommodating of a friend who dropped by while we were dining and wanted to sit with us for a few minutes. Highly recommended! We love Cork & Table! The service is great, the food is excellent and it's a romantic atmosphere. This is our second visit and we will definitely be back. First time dining at Wine and Cork. We had the four course meal with wine paring. Every course and wine paring were amazing!!! All prepared by the owner/chef. Quaint setting with avg decor and ambiance. Can’t wait to go back! Wine pairing menu. Delicious with many gluten free options. Quality not quantity. Waitress was knowledgeable about the wines. Second visit and will be back. Have consistently enjoyed great meals. The chef is the "boss of sauce". The wine options intentionally make good wine accessible. Very noisy. Intrusive service. Outstanding food. Reservations on-line were very restrictive, but there were many empty tables the whole time. We loved our experience at Cork and Table. The food was excellent, we loved every single dish, in particular the chocolate soufflé. Highly recommended. Excellent fooda and atmosphere. Everything was delicious and prepared flawlessly. Was a fun evening. Service and food was good. 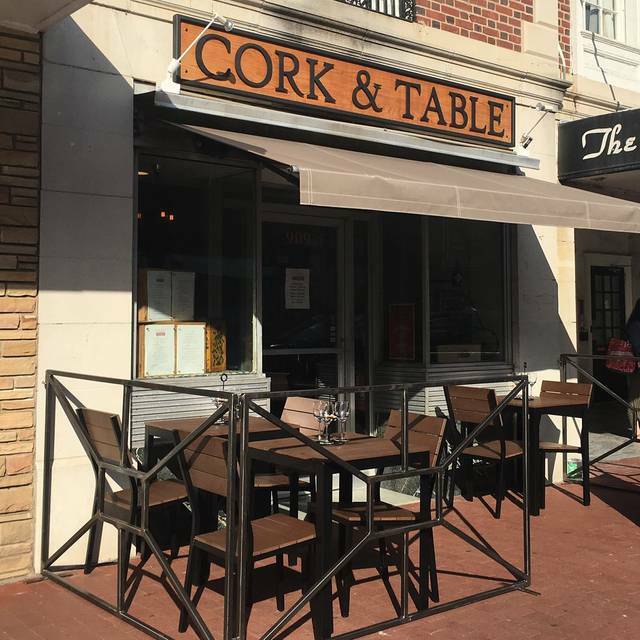 We have dined at Cork and Table multiple times and have never been disappointed. The food is always fresh, well prepared and delicious. This last visit saw us have the Four Course Fixed Price menu and again, the food was superb. My wife had the wine pairings with her meal and truly enjoyed the complimentary bouquet to each course flavor. The food, as always, was delicious! The scallopss are perfectly cooked. The sauces are spot on-- great depth of flavor. It is by far the BEST crab and corn chowder I've every had. I highly recommend the foyer course option with the sticky toffee pudding. Though I had eaten at Cork & Table several times plus my husband's wine club has held several of their dinners there, I was still nervous having recommended this for a friend's 40th birthday celebration. She, nor the other guests, had dined here before. It was no surprise everyone was thrilled with their meals. Service was excellent as usual. This restaurant never fails to live up to its potential as an incredible dining spot in downtown Fredericksburg. Kudos to the chef and the staff. RUDE, RUDE, RUDE! The chef took an immediate dislike to one of my friends as soon as she walked in the door and because he was waiting tables and he was "THE CHEF" he thought he had the right to dictate her choice of SALAD DRESSING by being an overbearing bully and refusing to honor her request for a different dressing on his "HAND CRAFTED SALAD" (of greens and a little blue cheese) and then arguing with everyone at our table when we called him on his abusive behavior. We will NEVER return to Cork & Table and advise everyone to avoid this restaurant because if you don't like something, or heaven forbid are allergic to something, and have the audacity to asking for a substitute, you'll find out that THERE ARE NO SUBSTITUTIONS and damn you for even asking! The prixe fix menu was awesome, wine choices were right on target, and the service was perfect. Absolutely amazing!! Our new favorite place. Food/wine pairing was perfect! I have celiac and almost the entire menu was GF. Like the prix fixe menu with the wine pairings but I wish the servers would've described each wine to us. They wouldn't even tell us the name of it unless I asked. For being called "Cork and Table" you would think wine would be their specialty. Also, they seemed understaffed as we had to wait 45 min for our entree to be served. Wonderful service, professional staff, excellent food and the prix fixe wine paring menu was a great value. This was our first time eating at Cork and Table. Very nice and helpful server. Food was very nicely presented and very tasty!